Optimize your chance to produce your recombinant protein efficiently! 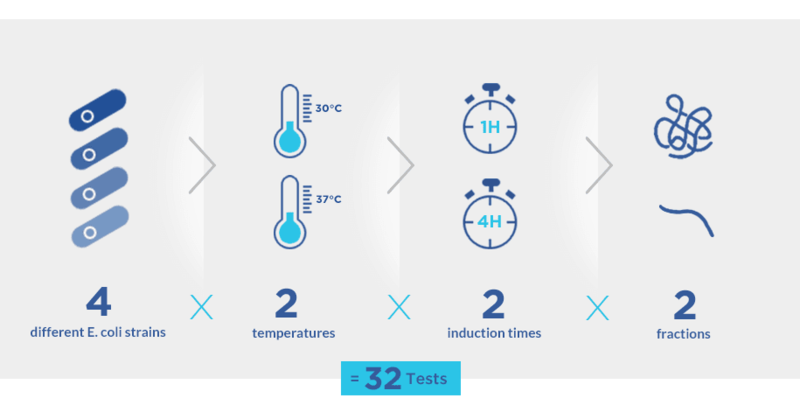 Our service of protein production in E. coli includes up to 32 protein expression tests in standard to guarantee that even the most difficult-to-express proteins have a high probability to be produced. protein production in E. coli? 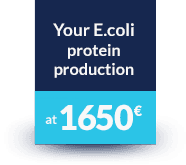 Our E. coli production package starts from 1650€. Our protein expression packages include up to 32 expression conditions tests at that price. Our E. coli protein production package includes a wide range of QC analysis. As a gene synthesis expert, ProteoGenix can include gene synthesis and efficient codon optimization to its E. coli protein production. We provide from milligram to gram protein expression in E. coli. Our PhD account managers are at your disposal to guide you through our solution of protein expression in E. coli. of protein expression in E. coli? Recombinant protein production is highly technical and requires strong expertise as one production protocol cannot fit all product types. With more than 16 years of experience and 1500+ proteins expressed, ProteoGenix developed an in-house protocol including up to 32 expression conditions tests in its package of “Protein production in E. coli” to meet the best your requirements. The technical possibilities are almost infinite and such a long lasting experience is decisive. You need to produce a protein in E. coli or want more information about our capacities of protein expression in E. coli? Our account manager is at your disposal to answer to your questions. All conditions are varied from codon optimizations, vectors with different promoters, protein sequences, purification tags down to the purification method itself, tag clivage conditions, refolding method and formulation. The advantage of protein expression in E. coli is the infinite range of solution and technology and ProteoGenix has a wide experience of all these technologies thanks to the large variety of project carried out until now. Gene synthesis including codon optimization for E. coli production. Gene subcloning in a high producing expression vector. Transformation of the plasmid into various bacterial strains. 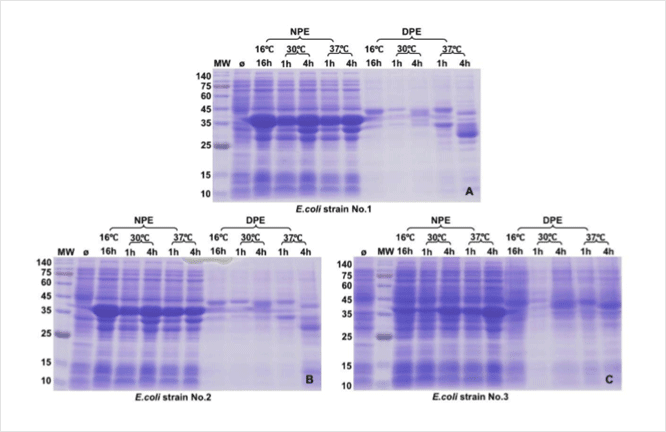 Evaluation of 32 protein expression conditions (temperature, induction time, fractions). Determination of the best protein production conditions. 1L protein expression and purification with optimized conditions previously determined. Quantitative analysis by Bradford method. One of our customers requested a recombinant protein production in E. coli. This project included also gene synthesis and subcloning in an expression vector (information included in the PDF report). More details about the protocol are provided in the complete PDF report. Figure 1 : Expression tests of the target protein. Coomassie blue staining Reducing-PAGE analysis of NPE and DPE. MW. Molecular weight marker. Ø. Non-induced bacteria culture (negative control). Induction with IPTG 1mM. The protein is expressed at high level in all strains tested, and is mainly localized in NPE (Figure 1). The optimal conditions for native expression are indicated in the complete PDF report. A small-scale (200ml culture) purification test was performed in native conditions. Starting material: NPE prepared after optimal native expression. Details about the protein purification protocol are available in the complete PDF report. Figure 2 Purification test of the target protein. Reducing-PAGE analysis with Coomassie blue staining A. Purification profile. B. Final sample QC (after buffer exchange) MW. Molecular weight marker. IN. Input. FT. Flow through. W1-W3. Wash steps. E1-E9. Eluted fractions. The target protein was purified in native conditions (Figure 2). The yield and purity obtained are detailed in the Table 1. E. coli is a well-characterized organism for protein production and was the first host expressing an approved therapeutic recombinant protein (human insulin, Eli Lilly, 1982). Fast and easy plasmid transformation. These advantages make E. coli the best choice if you are looking for a fast and cost effective protein expression solution. However, protein production in E. coli may not be the most relevant solution for the expression of complex protein structures including post-translational modifications or biotherapeutic productions due to high levels of endotoxin (which can be removed thanks to our endotoxin removal service). To get more information about our protein production in E.coli platform, please feel free to contact our dedicated account manager. Thus, many microbiologists developed protein refolding protocols allowing the exploitation of these inclusion bodies as a source of recombinant proteins. At ProteoGenix, we developed a unique protein refolding platform tailored to best exploit recombinant protein expression and meet your requirements. To get more information about it, please feel free to contact our dedicated account managers.